On Thursday, French defense ministry officials confirmed the deployment of French special forces in northern Syria with the announced purpose of advising Syrian Democratic Forces (SDF) in the recapturing of the city of Manbij from Daesh; however Russian military experts told the Russian media what might really be behind the move. Leonid Ivashov, retired General Colonel, former chief of the department for General affairs in the Soviet Union’s Ministry of Defense and currently the vice-president of the Academy on geopolitical affairs says that the French forces are not taking part in the fighting directly. “The French units, more likely, are conducting reconnaissance and acting as air controllers. They also support contacts with the terrorist groups, among others, in the hope of being able to influence the overall situation in the region,” he said in an interview with Svobodnaya Pressa (Free Press). The retired General Colonel also noted that such a group (about 100 people) could not play an important role in the conflict, but these activities serve as training for the French military in peaceful time but in combat conditions, what he described as a “run-in test” for the special forces.He added that the French presence in Syria is also important from the political point of view, because in this case President Hollande can announce that the authorities are actively participating in the fight against terrorism.This announcement will be reported by the mass media, hailing the president’s decision. In other words, the idea of two gas pipelines, which what the Syrian war is all about, is still hanging in the air: the first pipeline was to be from Qatar, Saudi Arabia, Jordan, Syria and Turkey further into Europe; the second one, known as the “Islamic Pipeline” was supposed to run Iran-Iraq-Syria and further through Mediterranean Sea into Europe,” he explained.The expert added that the failure of the Qatar project has not discouraged the ‘game players’ and the project might be revived, taking into account the thaw in relations with Iran and active Kurdish position.In this case, he explained, the recapture of Manbij is of key interest, as there meet the interests of the US and Europe. The recapture will enable control of the border city of Jerablus, which is essential to the unification of the Kurdish cantons of Afrin and Kobani.The Turks are against this scenario, he said, but it seems that nobody is listening to them. The problem however is that the SDF have encircled the city, which was not very difficult due to the open landscape and the aerial support of the US-led coalition.But the Kurds are unable to enter the city on their own, this is beyond their potential. They don’t have such special forces which could efficiently fight in a city. Besides, Daesh has relocated some of its forces from the border city of Azaz to Raqqa and to Manbij, seriously reinforcing their positions there. 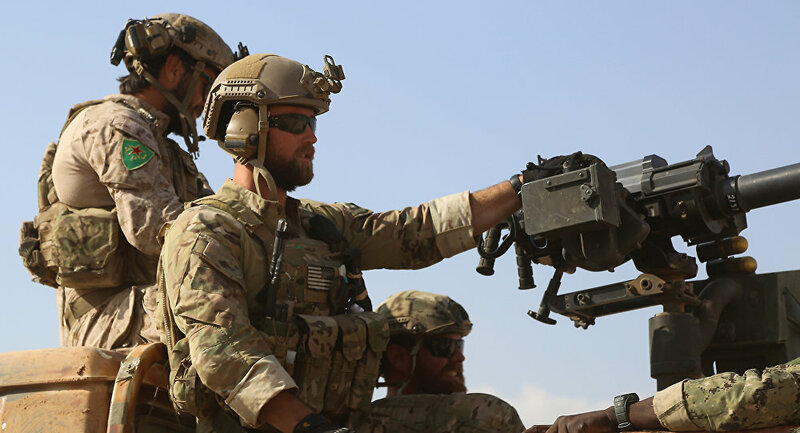 This could be one of the main reasons why the French forces appeared near Manbij, where the American and British special forces are already operating. ‘Semyon Bagdasarov, Director of the Moscow-based Center for Middle Eastern and Central Asian Studies is convinced that the move will lead to the division of Syria.“The French now want to settle in Syria, and the simplest way is to do it in the north-east of the country, together with the Americans,” he said in an interview with Svobodnaya Pressa.The expert also noted that in March the Kurds announced the creation of a federal region in the north of Syria. They also set up a council which united not only the Kurds, but also Arabs, Assyrians, Christians and Turkmen.